We don’t hunt rhino horn or elephant tusk in New York City. The big game in this town—for restaurateurs, anyway—is old-world dining rooms. Recently, many of our withering restaurant institutions have been sold off, scrubbed clean and rebranded: Cigarette smoke patinas approximated with sponge painting, the scratchy purr of phonograph music piped in through cutting-edge sound systems. The best of these restaurants function as savvy preservations—better a raw-bar tower than a bank branch, after all. 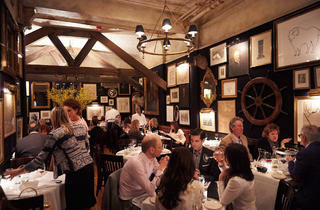 Keith McNally did stellar work at Minetta Tavern; Gabe Stulman at Fedora; Wilson Tang at Nom Wah Tea Parlor. But other projects, like Bill’s Food & Drink, feel a touch more cynical. Until a landlord dispute forced its saloon doors to swing shut in March 2012, the Prohibition-vintage barroom Bill’s Gay Nineties had a die-hard fandom. Whiskey flowed, shrimp cocktails were gobbled up on green-checked tablecloths, and pianist Rick McDonald banged out standards on the creaky upright. 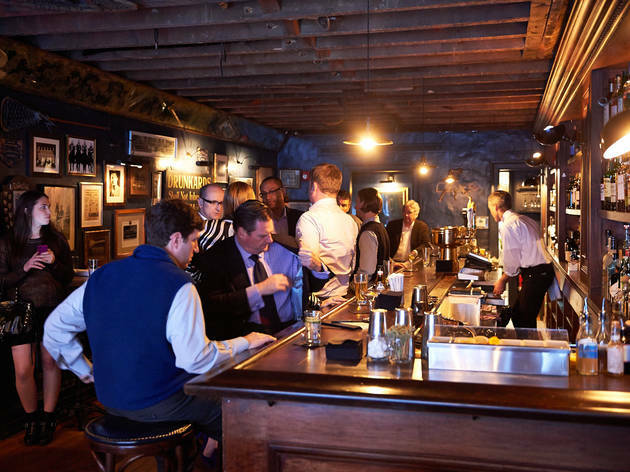 But late last year, the reins of this 88-year legacy—held since the ’70s by Barbara Bart Olmsted, who inherited the place from her father—were handed to John DeLucie, a chef with plenty of experience cashing in on urban nostalgia at spots like the Waverly Inn and the Lion. 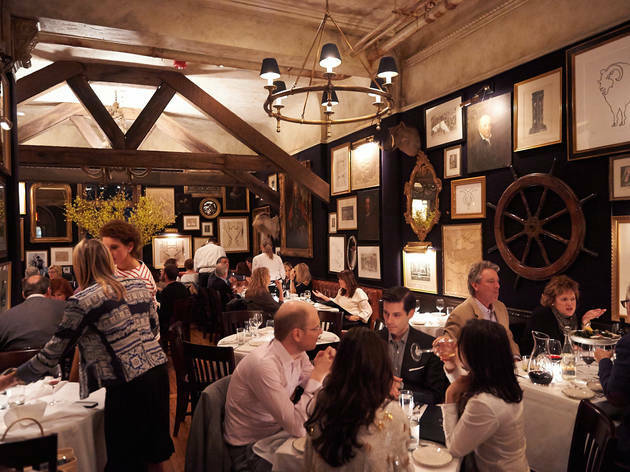 In place of the period-authentic vaudeville Playbills and prizefighter placards that used to line the dining room walls, there are now gilded mirrors, mounted taxidermy and arbitrary portraits of plutocrats. Where once there were unfussy fingers of liquor poured over ice chips and swallowed in a hurry, the bar now serves classic cocktails—Hemingway daiquiris tarted up with fresh-pressed grapefruit juice; a Fernet Branca–splashed Hanky Panky served in a spindly coupe. Whether you see this cultural cleansing as progress or sacrilege, the quality of the food has certainly improved. Former Gotham Bar and Grill chef Jason Hall is in the kitchen, dispatching $110 caviar service and big-ticket steaks (a porterhouse for two runs $125). He’s capable enough at handling the meaty end of the menu. A bacon chop was rich and textbook tender, with a slick of mustard to cut through the fat. A rib eye, aged for 28 days to tease out its minerality and portioned for one at $58, was pink and musky beneath an aggressive char. 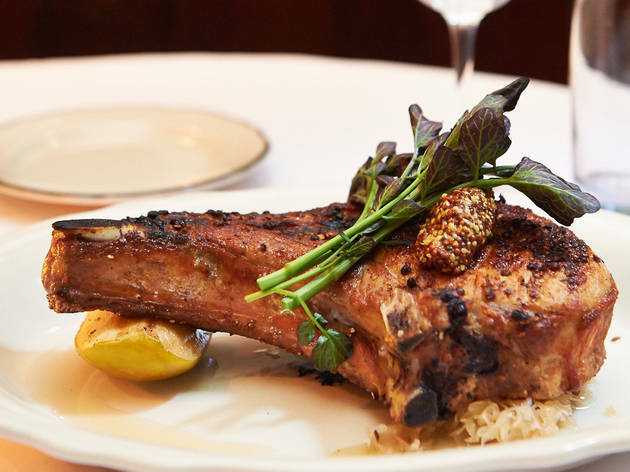 Reach above the steakhouse canon, though, and there’s not much worth eating. A $16 kale salad—a sort of evolution of the classic Caesar—offered tough greens painted in gluey tahini dressing, with green apple and cashews. A ravioli special arrived in lifeless bundles, dense pasta sheets pressed around pasty ricotta cheese, dressed with asparagus, fava beans and an insipid Parmesan foam. Of course, not everything has changed. McDonald is still tickling the ivories. There are still silver dollars spelling out bill’s embedded in the barroom floor. But in this new context of robber-baron luxury and pricing, nods to the space’s everyman history start to feel distasteful. As you settle your exorbitant tab and survey this Old New York™ mise en scène, you may find your hackles raising. You might get to thinking that DeLucie is a bit of a carpetbagger, who hasn’t rescued the memory of Bill’s so much as co-opted it—lopped off its balls and sold it back to you at a staggering markup. You might start to wonder if someone should have to answer for all of this. The shoulders of a legend, it turns out, are a perilous place on which to stand. 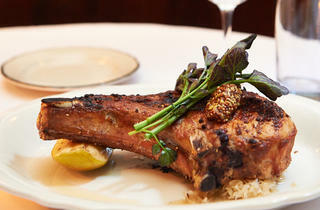 Eat this: Stick with meat: The bacon chop and 28-day rib eye will do fine. Drink this: Cocktails like the balanced Hemingway daiquiri—overseen by Ben Scorah—are quite good, as they should be at $15 a pop. A glass of lower-end prosecco or French malbec can be had for about the same price. Conversation piece: Not content to exploit only its own legacy, the new Bill’s has also pulled in talent from another classic midtown restaurant. Bartender Doug Quinn, who had a devoted following at P.J. 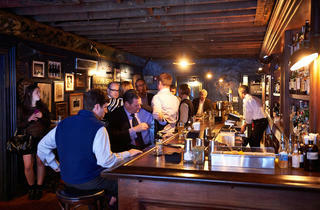 Clarke’s until he was ousted from the restaurant last year, shows up behind the stick. A little corporate and stuffy but generally fine for getting a drink with coworkers who you don't like toooooo much. Definitely an older crowd but tolerable.